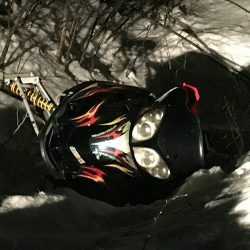 Local fire departments and snowmobile groups were called on to aid the Maine Warden Service for a wreck on a trail in Roxbury. ROXBURY — An Andover man was killed Thursday night in a single snowmobile crash on a trail near Roxbury Notch Road, according to the Maine Warden Service. Gregory Simmons, 47, of Andover died Thursday night after he was ejected a 2006 Arctic Cat F6. Gregory Simmons, 47, of Andover was killed when it appears he lost control of his machine on Interconnecting Trail System 84 and was ejected, according to a statement Friday morning from Maine Warden service spokesman John MacDonald. A snowmobiler who found the crash scene reported it at 9 p.m. Thursday, according to McDonald’s statement. Simmons was riding a 2006 Arctic Cat F6 home from the Knotty Moose restaurant, according to wardens. Game wardens say speed appears to be a contributing factor and Simmons was wearing a helmet. Roxbury, north of Rumford, is home to several ATV and snowmobile groups. Rescuers were attempting to round up snowmobiles from local groups and fire departments as their efforts got underway.